Fran's Chocolates is a Seattle area chocolate maker, with several boutiques around there, plus retail distribution nationwide. Their specialties are salted caramels, dessert sauces, drinking chocolate, and "Gold Bars", although they also make truffles, bars, dripped fruits and nuts, and more. They are certified Fairtrade and Organic. Yadda yadda. I've only tried the caramels, when I received a small gift box. Gray Salt & Smoked Salt Caramels. "Our best-selling and award-winning Gray and Smoked Salt Caramels feature a harmonious blend of complex flavors - rich dark and milk chocolate, soft buttery caramel and the unexpected boldness of the gray and smoked sea salts." 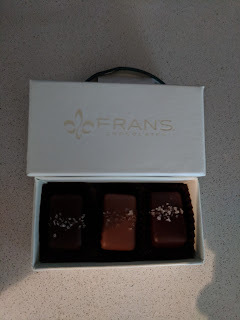 My box was a duo, two each of the dark chocolate with gray salt, one milk with smoked salt. Since I prefer dark chocolate, that is the one I went for. "Slow-cooked, soft butter caramel is dipped in dark chocolate and finished with a sprinkling of gray sea salt harvested off the coast of Brittany." The dark chocolate was decent quality, smooth, dark chocolate. I did really like the pops of flavor from the salt. Dark chocolate and salt are wonderful together. The caramel, also fine. Slightly chewy, decent flavor, the kind of caramel that is sorta stringy as you pull away from it. It all went together fine. It was like a nicer version of a Riesen. Which just isn't my thing, but, the quality was obvious. I left my box of chocolate unattended, and, uh, the others disapeared. So I never got to try the smoked salt milk caramel, which was supposed to be the same soft caramel, this time dipped in milk chocolate, and finished with "sea salt that has been lightly smoked over Welsh oak". I think I'd love the smoked salt, but, milk chocolate is rarely my thing. "Hey Julie, we have pastries from Mr. Holmes, want any?" You know I went running. Fast. Mr. Holmes Bakeshop is known for creative pastries, which I've reviewed before (below), but this one was certainly the most unique so far. Twice Backed Coffee Stout Croissant. $5.80. "Brown sugar cake, stout beer cream, chocolate glaze, coffee crumb, dark chocolate brownie." When I got this, I got it from an event where someone brought in Mr. Holmes goods, so I didn't know what it was. I saw that it had chocolate glaze and some kind of crumble, and brownie chunks, and that was enough to draw me in. It also was clearly split in half, so I expected some kind of filling (which, it had). The toppings were a bit odd, to be honest. 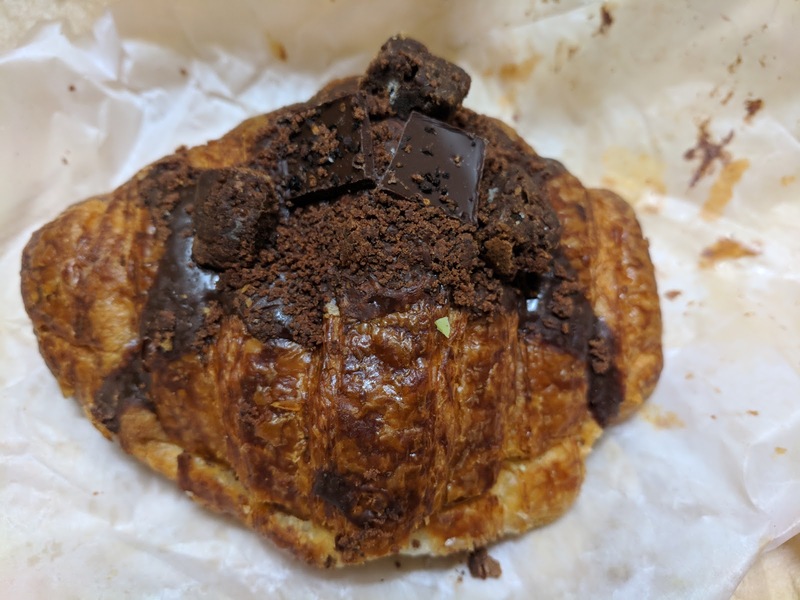 Brownie chunks on top of a croissant? I mean, they were fine brownie chunks, but, I didn't really want or need brownies with my croissant. The dark chocolate glaze was good, thick like a ganache. I didn't realize the crumb was coffee, I thought it was just chocolate or brownie, but I can see it in retrospect kinda, it did have a bitterness. So, the toppings were ... interesting. They certainly added flavors and textures, and looked crazy. But what was inside confused me more. Twice Baked Coffee Stout Croissant: Inside. The croissant itself was fine. Flaky. Not too oily but clearly decadent. But the filling confused me greatly. It was a cream. Or a paste. It had a consistency of mushy banana. But didn't really taste like banana. But if you can imagine mushy banana, that is what it was like, not light like cream, not smooth like a custard, not exactly a pudding. But it seemed to be cream based. And it had a flavor to it. I guessed rum. Something boozy. I couldn't pinpoint it, but it wasn't a simple flavor. I still kept thinking "banana" due to the consistency, but it didn't seem quite right. Banana rum cream filled croissant topped with chocolate sauce, brownies, and cake bits? I was so confused, and clearly had to look it up. It turned out to be "brown sugar cake and stout beer cream". Uh, of course? Clearly. But I don't like beer. Oh, but the thing is? I LOVED the filling. 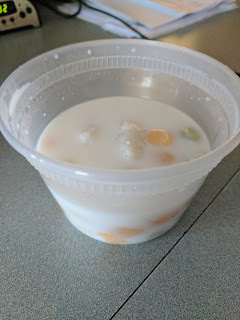 Yeah, the texture was strange, thick like a pudding, and the flavor I couldn't identify, but it was complex, and it was sweet from the brown sugar. And there was tons of it. I wanted a bowl of that filling, just like a pudding. Who needed the croissant, and certainly, who needed those brownie bits? Overall, fascinating, but, wow, that filling. Wonderful, and it made the whole adventure with this pastry worthy it. "Oh, Julie, what are you doing from 10:30-11:30? ", was a greeting I received from a co-worker one morning. I replied that I was headed to a meeting until 11. She told me I should swing by an event she was hosting when I got out of my meeting, and then she added it to my calendar. She promised tasty things. I knew nothing more. I had no idea what I was in for when I stepped into the room a little after 11, but was beyond thrilled when I saw the display from Mr. Holmes Bakehouse. I had their goods once before at an event and I was pretty impressed, so I was eager to try more goods. For more background on the insanity that is Mr. Holmes, go start with my previous review, and then return here. I didn't know what the items were exactly when I was at the event, but, I looked them up afterwards. I was immediately sad that I didn't have the insider knowledge when I was selecting my treats, as I certainly would have grabbed different items. churro croissant (I thought it was just cinnamon sugar coated, but, it was filled with dulce de leche cream! ), ferrero rocher croissant (filled with hazelnut and dunked in chocolate coating), matcha croissant (matcha white chocolate coating), and seasonal fruit danish (with brown butter streusel and pastry cream). The donut was rolled in cinnamon sugar and stuffed with white mocha raspberry cream. And the cookie even was far more exciting than it looked, brown butter caramel with cornflakes! I first grabbed a giant bear claw (not pictured because I had already snagged it from the platter), but came back for more later in the morning. Since someone had already cut into the ferrero rocher croissant, I too cut off a chunk and tried it. It really was a quality croissant, perfectly layered, flaky, crispy on top, buttery, shiny. When I saw the green dipped one remaining later, I hoped it was matcha, and grabbed that for myself. The matcha croissant was also good, again, a great specimen of a croissant. The inside folds were moist and buttery, the outside flaky and messy in all the right ways. The white chocolate matcha coating was very well balanced, strongly matcha flavored but not bitter, and not overwhelming sweet from white chocolate either. Very good, although a bit simple. 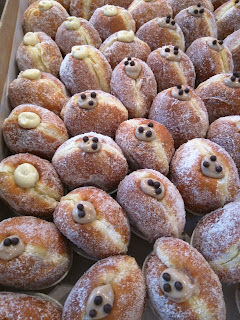 Cookie Dough Bear Claw / Cookie Dough Mousse. $4.50. Like I said, I didn't know what anything was when I was at the event, and I just picked this one for myself as it was the biggest and most decadent looking. You know how I roll. 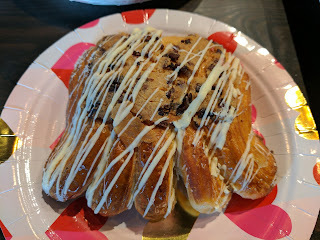 It turned out to be a bear claw, stuffed with cookie dough mousse, topped with cookie dough crust, and drizzled in white chocolate. It was massive, a real bear paw. And I ate it. All of it. It was good. It was very good. Like the croissants, the pastry was fantastic. Incredible layers, buttery, flaky, slightly crispy, just, perfect. I liked breaking the fingers off one-by-one, and eating them as delicious croissant-bites. The cookie dough coating on top was kinda fun, full of crunchy little cocoa nibs. It reminded me of a pineapple bun from a Chinese bakery, you know, the kind that look like pineapples because they have the crunchy sweet sugar cookie topping? It was good, but unnecessary on top of a bear claw that was also drizzled with white chocolate (yay, more sweet topping), AND stuffed with cookie dough mousse. Cookie Dough Bear Claw: Inside. Let's talk about that mousse. I cut the claw in half to reveal the contents, and found it very generously stuffed with the pastry cream. The cream was absolutely loaded up with mini chocolate chips, making it very chocolatey. It was sweet, it was creamy, and had a nice texture from all the chips. I didn't love the filling, but it was good. 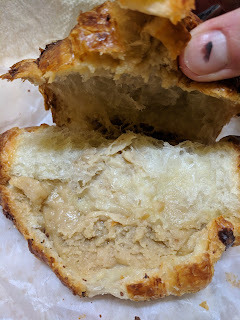 There was so much of it that it was actually too much with just the main part of the claw, but I found that I could break a finger off and dunk it in the extra filling for a "perfect bite". I also clearly enjoyed dissecting this thing as I devoured it. Overall, this was very good. I was a bit shocked to find that I ate the whole thing in one sitting, as it really was quite large. But, such quality pastry, seriously, look at the layering here on the interior! It was also a fairly fascinating item, so it held my interest. 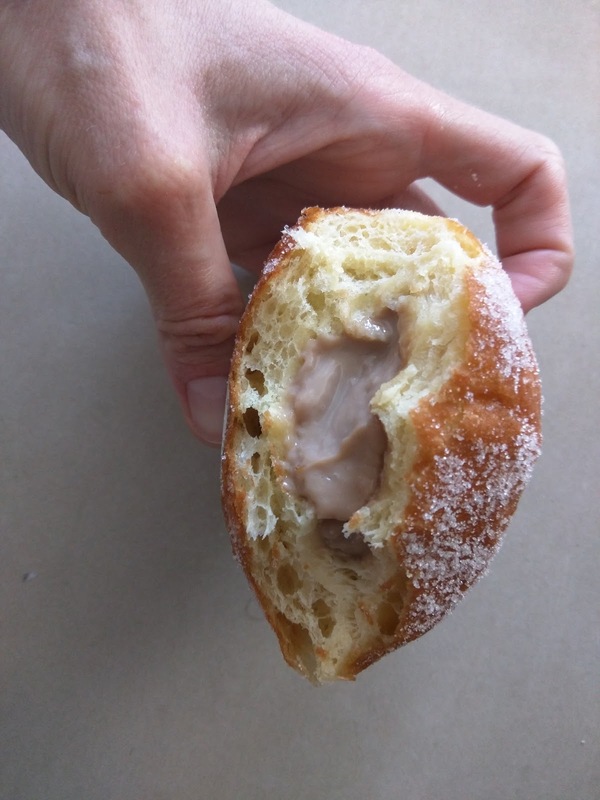 A couple years ago, Mr. Holmes Bakehouse hit San Francisco by storm. 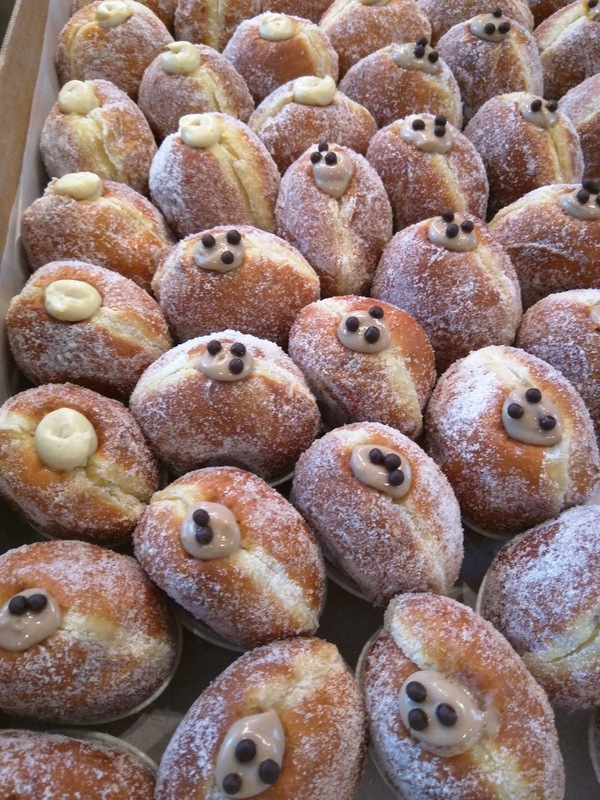 If you follow the bakery media at all, you certainly know about Mr. Holmes, for any one of several reasons. Mr Holmes became a phenomenon instantly as they introduced the cruffin. Yup, a croissant muffin hybrid, with a flavor that changes daily. Limited to 2 per person. They sell out ridiculous quickly. The website has a countdown timer until the next morning when they'll be available. They also became everyone's favorite Instagram place for something besides the food: their slogan, which is "I got baked in San Francisco". It is printed all all their packaging, but, also, in huge neon letters in the store. And then, finally, the scandal. The bakery was broken into. And the thief stole only one thing: recipes. No cash. Just the cruffin recipe. You can't make this stuff up. Trendy baked good. Limited supply. A robbery. A silly slogan. Their marketing department did well. The place was known for crazy long lines, and the hype just grew and grew. They now have a location in Los Angeles and in Seoul. Since I love baked goods, you'd think I would have been all over this opening. But, actually, it seemed like a lot of hype to me, and I just didn't feel like getting up at 6am to get in line for a cruffin. 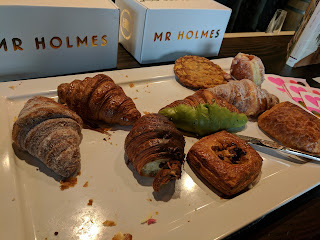 So I waited, until I attended an event with Mr. Holmes baked goods. Of course, that means I still haven't tried a cruffin, since you can't get more than 2, and they don't offer them for catering or delivery. That said, their other items are no slouch. Many others have made waves too, like the California croissant, stuffed with smoked salmon, ginger, wasabi, and nori. They also have a kouign amann, a number of fascinating danishes, and even just their basic croissant has won awards. Most of the Mr. Holmes menu changes seasonally, like the danish fillings. But the aforementioned cruffin changes daily, as does their donut. They always offer two flavors of each, named Le Donut #1 and Le Donut #2. Given how much I like donuts, I was thrilled when the event I attended had them. Le Donut #1 (coffee). $3.50. I started with Le Donut #1. I was not sure what flavor it was. I was told "pistachio" by the host, but I'm quite certain that was not right, as I didn't taste a hint of pistachio in here. Ojan described his as "weird, I can't figure it out". In the end, I thought it was mocha. I followed up with the bakery the next day because I was really curious. The answer? Coffee. 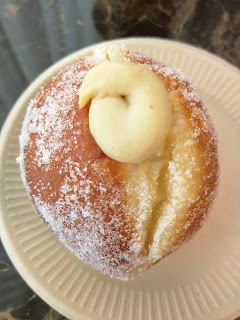 The donut was ... ok. Nicely coated in sugar, not too oily, stuffed very, very, very generously with the filling. I think the part I didn't enjoy was the filling. There was tons of it, it was very think, and kinda gritty, and I spent the whole time trying to figure out what it was. 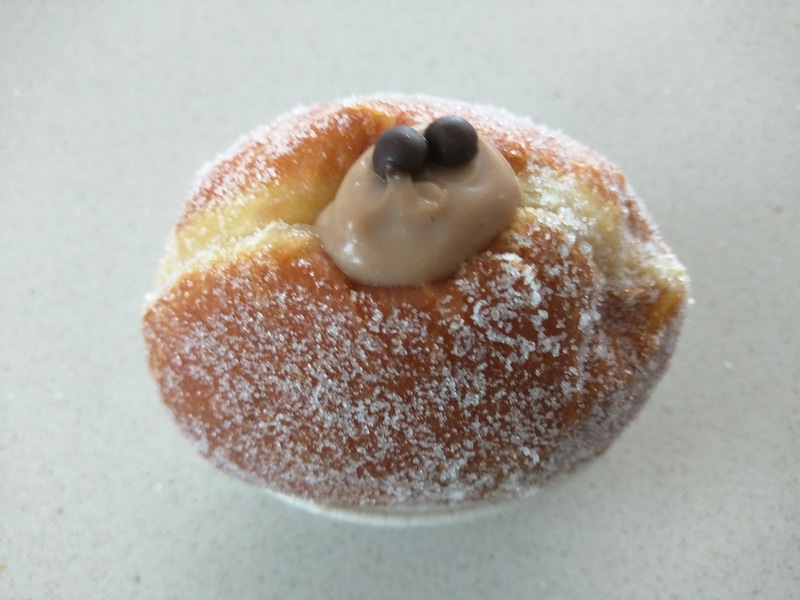 Le Donut #2 (chocolate). $3.50. So, I took one of the other kind, and kept it "for later". The second one was milk chocolate filled, with two little chocolate crunchy balls on top. You can also guess about how much later, "later" really was. This one also was perfectly coated in sugar, and generously filled with cream. Here you can see just how much filling was inside, they really aren't messing around with the filling. Both Ojan and I liked this flavor much more, because the chocolate cream was smooth like a nice pudding, and not gritty like the filling in the coffee one. I still didn't love the filling, but, sugar coated fried dough is always a good thing. Ojan devoured his and asked me to get him another. Yes, after eating 2 of these, he wanted another, stat! Cookie: Chocolate, sea salt. $3. You know I'm not really one for cookies, but, I got this for Ojan. And as always, I took a bite. And then, I went and got myself one. For a cookie, this was great! It had a generous sprinkle of large sea salt crystals on top, which really amped up the flavor. 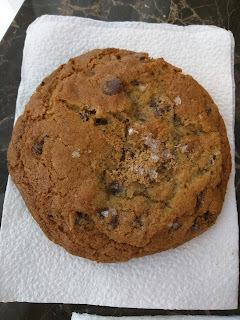 It was still a hard, crispy cookie, so, not my favorite item, but, it was a good one. The chocolate chunks in particular were really tasty. It was also rather huge, a very hefty size for the $3 price. And finally, a basic croissant. I wasn't able to try the crazy California croissant, but, this plain croissant has earned its place on many "Top 5 in San Francsico" lists. It was a pretty decent croissant. Crispy exterior, moist interior, very strong butter flavor, laminated. 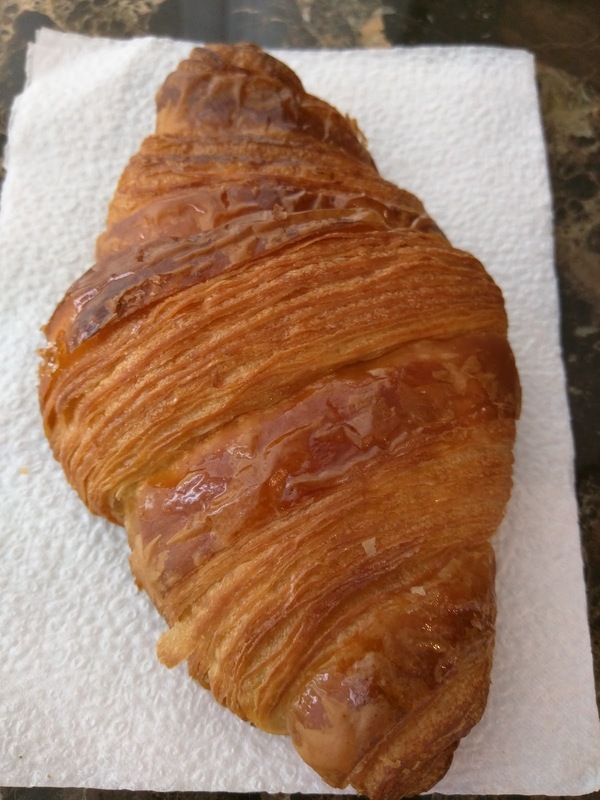 Not mind blowing, but for a plain croissant, very solid, and on par with the best I had in Paris. 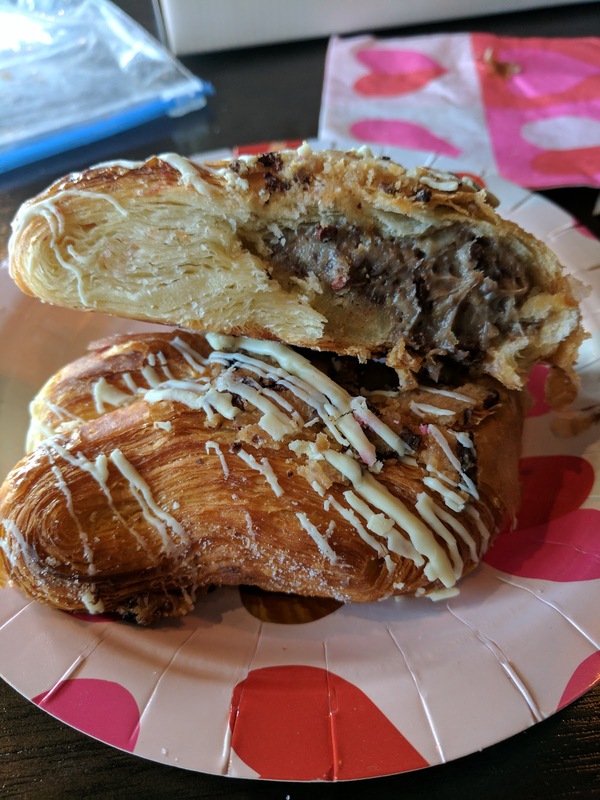 Ojan took one bite of his, and said, "hmm, this is a pretty good croissant!". When I returned to the room a few minutes later, he further raved, "I don't normally like plain croissants, but this grew on me!" I've waffled a lot of crazy things over the years, as you know (and if you don't know, rewind, go to my master post about my love of transforming leftovers via my waffle iron). But this, this might be one of the most unique things I've waffled to date. 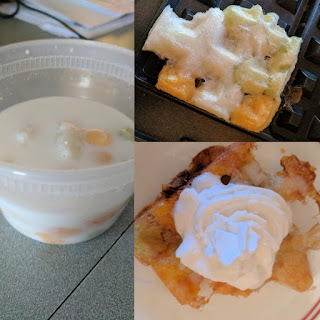 I waffled a thai dessert. Because even though I didn't care for the original, I couldn't bring myself to throw it away. So I did what I always do in this situation - I threw it in the waffle iron, and hoped it would create magic. And this time, it did. One of my biggest successes, and best transformations, to date. Bauloy Samsee: Will it Waffle? is a resounding YES YES YES! The original was thai dessert from Bangkok Asia Cafe and Grocery in Lebanon, NH, where I took a gamble and picked up a thai dessert while visiting my family. It was served warm, a thin coconut milk broth, with glutinous rice balls of three colors (green, orange, and white). The rice balls were infused with pandan, sweet potato, and (I think coconut), but all were fairly flavorless. The balls were very soft, and many were lumped together. They just weren't very good. The coconut milk was slightly sweet, and tasty enough actually, but, overall, it just wasn't enjoyable. 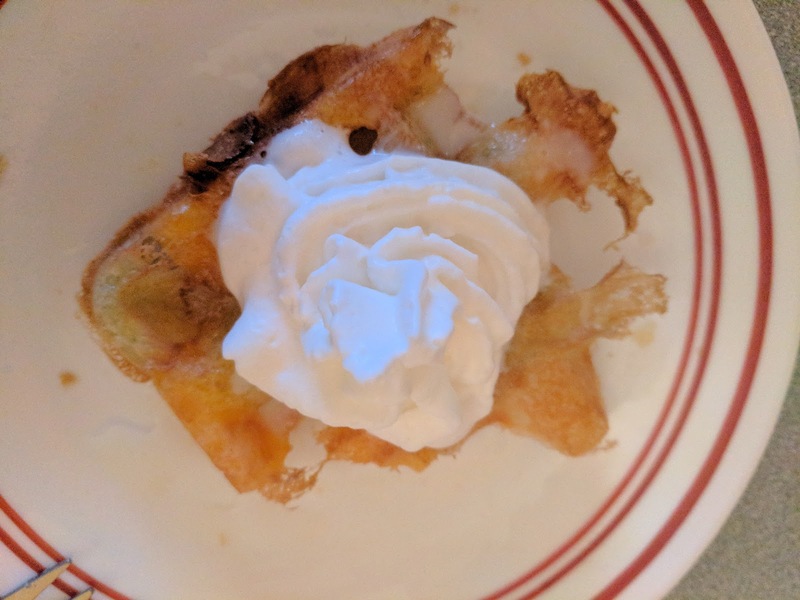 I really didn't want to waste it though, and, I really wanted a dessert to enjoy, so I decided to remove the rice dumplings, and, well, waffle them. I actually thought this would work well, like a mochi waffle, why not? My parents thought I was crazy (even though just the day before, they had watched me waffle leftover poutine to great success). I pre-heated the waffle iron to my standard 350 degrees. I started with a small batch to test. I simply plucked a few of the dumpling balls from the broth, and put them into the waffle iron. I didn't crust it, I didn't do anything really. I barely bothered to make sure I grabbed a few of each color. Just put them in, closed the lid, and walked away for about 5 minutes. I checked halfway to see the balls mushing together to form a solid waffle. Then they puffed up, and then got nicely crispy. 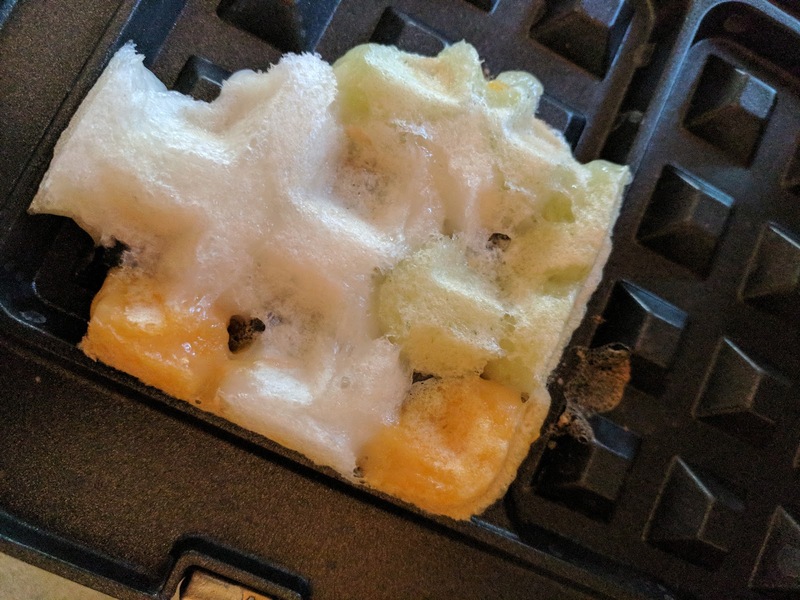 I was able to extract my waffle with zero effort. Well, huh. I tried a chunk. It was perfectly crispy on the outside, yet crazy moist and gloopy in a good way inside. 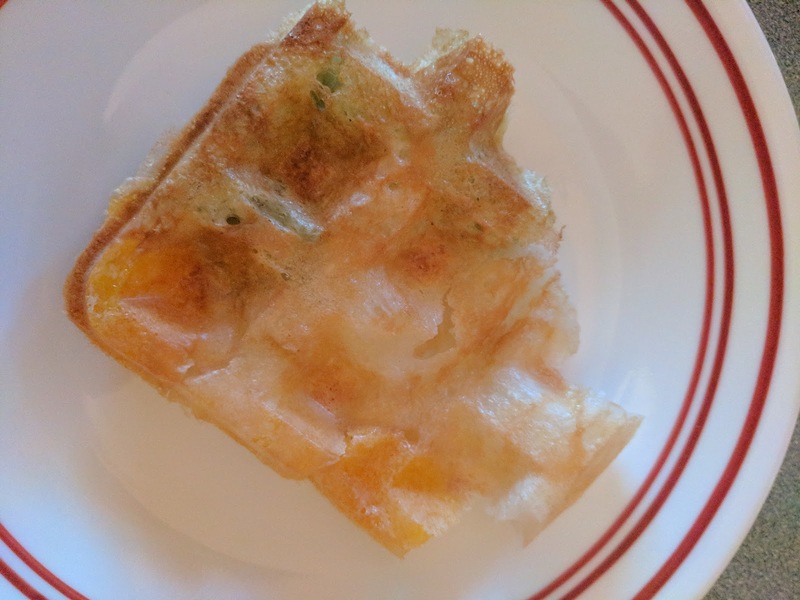 I had made a mochi waffle. I drizzled the coconut milk sauce over the top, and added some whipped cream. It was really, really good. I loved the crispy exterior, I loved the soft inside. 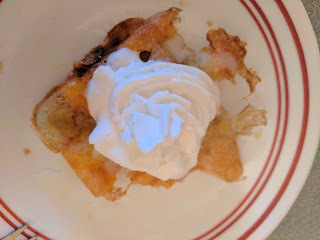 The flavor even seemed better, and the coconut milk broth worked much better as a drizzle, particularly when combined with the thicker whipped cream. I adored my creation, and immediately returned to waffle the remainder. Not only did this salvage something that was lackluster, it was truly delicious, and honestly, I'd get the dessert again, just to do this. 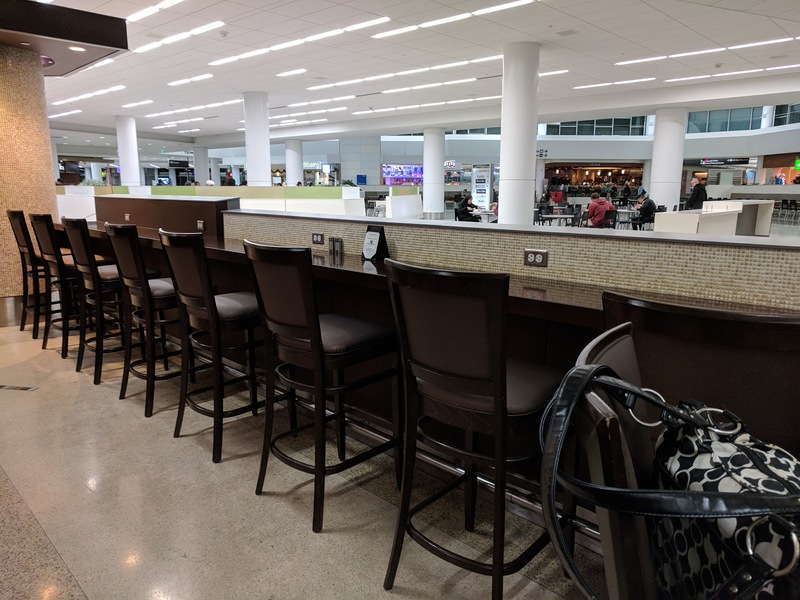 I often fly in and out of Terminal 2 at SFO, but I don't generally dine there. 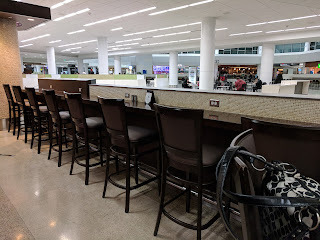 I do of course grab tasty salads, snacks, and desserts from Napa Farms Market to bring on board, will frequently cruise through Pinkberry, and Natalie's Candy Jar is *always* on my agenda pre-flight, but actually eating a meal in the terminal? Nah. But on a recent flight, I was delayed, and arrived at SFO around 7pm. I didn't have checked baggage, and I didn't want to deal with figuring out dinner once I finally got home, so, I decided to just eat at the airport, for literally the first time. 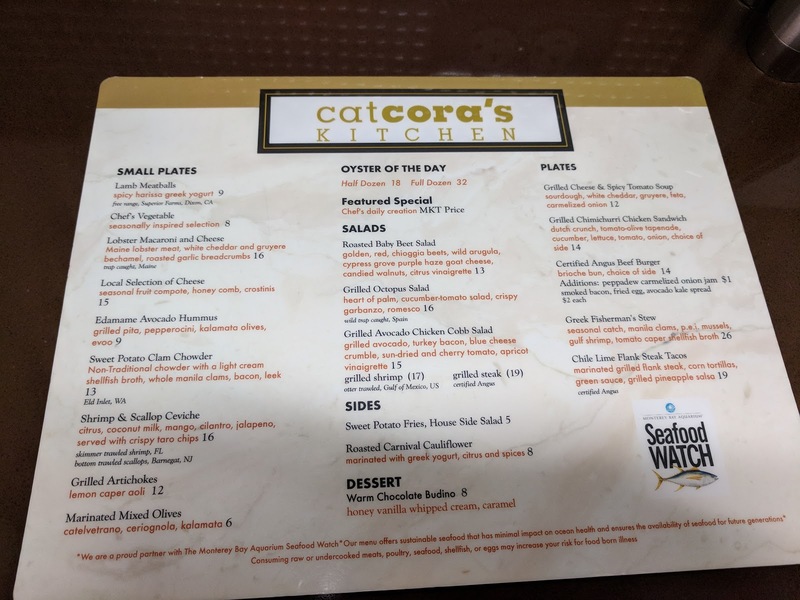 Cat Cora is known most for being an Iron Chef, but, she got in that position due to successful restaurants originally. Her empire has expanded to include some casual bar and tapas style places, located in airports. Like SFO. Now, celebrity chef's airport locations are usually not worth checking out, but, I dunno, I decided to go. I wish I had just grabbed a reliable Napa Farms Market salad and gone home. 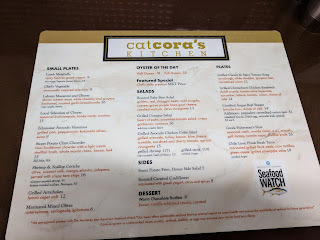 Cat Cora's Kitchen is located inside the terminal, but it has a nice bar and counter area looking out into the terminal. Power outlets are supplied. The bar had all seats occupied, with patrons watching a game on the big screen TVs. They looked happy to be hanging out there. I sat at the counter on the side, in a quiet place, happy to decompress alone. The cocktail menu actually sounded great, but, I had wine (and lots of snacks) on my flight, and needed to work early in the morning, so, I just went for a light meal. The menu did have some good sounding dishes, like lobster mac and cheese and sweet potato fries, but, I wasn't feeling something that heavy, so opted for something from the salad section (note, I don't say I had a salad ...). The menu had only a single dessert, chocolate budino, which was disappointing as I don't have chocolate at night, but then I remembered that my partner had a slice of eggnog cheesecake waiting for me at home, so, I quickly got over my disapointment at the lack of dessert menu. "Heart of palm, cucumber-tomato salad, crispy garbanzo, romesco." I was impressed, visually, when my order was delivered. It really did look quite good. This was really airport dining? Except ... it was. It looked great, but, wasn't actually well prepared. I'll start with the good. The romesco. It was very flavorful, and I actually loved it. I coated all the lackluster veggies in it, and used my knife to scrape up every last bit. The romesco was fantastic. The crispy garbanzos were also quite good, well seasoned, crispy, nice crunch. The cucumber, tomato, and hearts of palm, basically, the "salad" components, were all ... fine. None of it seemed particularly fresh or ripe, and I don't really like cucumber in the first place. The hearts of palm was the most disappointing, it seemed like jarred stuff. But the real disappointment? The octopus. It did look pretty decent. A huge piece. Good color on it. It looked grilled. But ... it was soft. Soggy. Kinda rubbery. I still don't really understand how it looked so grilled, yet seemed so soft. It wasn't crispy anywhere, not even the thinest tail piece. I tried bites from all sections, hoping to find a good piece, but alas, it just wasn't well prepared at all. Overall, this was just not good. Horrible octopus, kinda old tasting hearts of palm, mediocre veggies ... the flavorful romesco couldn't save it. I also ordered it because I was craving some greens, and thought the "salad" would include some salad greens, but I realize now the menu never said that, so, that was my bad. Still, this was poorly done enough that I wouldn't return. I love taro chips. 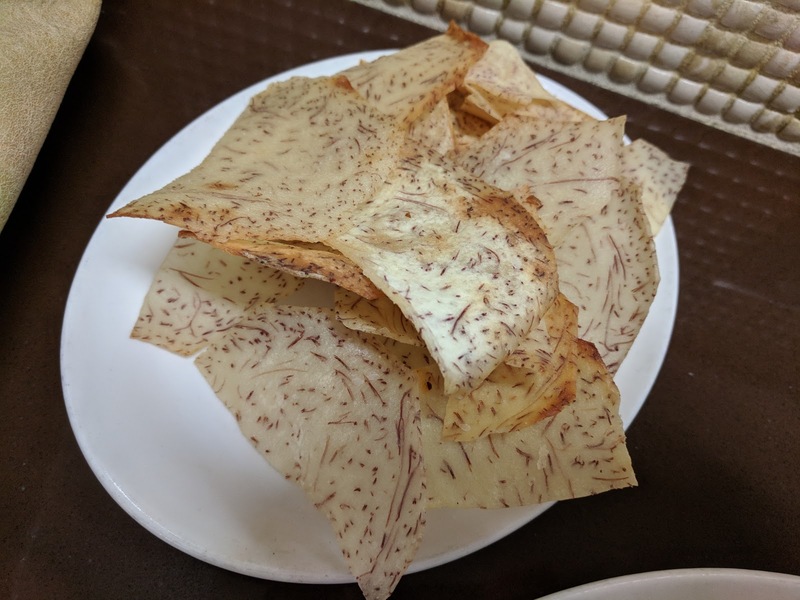 The menu had a ceviche served with taro chips, so I asked if it was possible to get just a side of taro chips. My server happily said yes, commenting on how good they were, and how she didn't blame me. The taro chips were ... fine. Crispy. Over-salted. Not much taro flavor. I don't think freshly made. I'm glad I tried them, but not worth getting again. 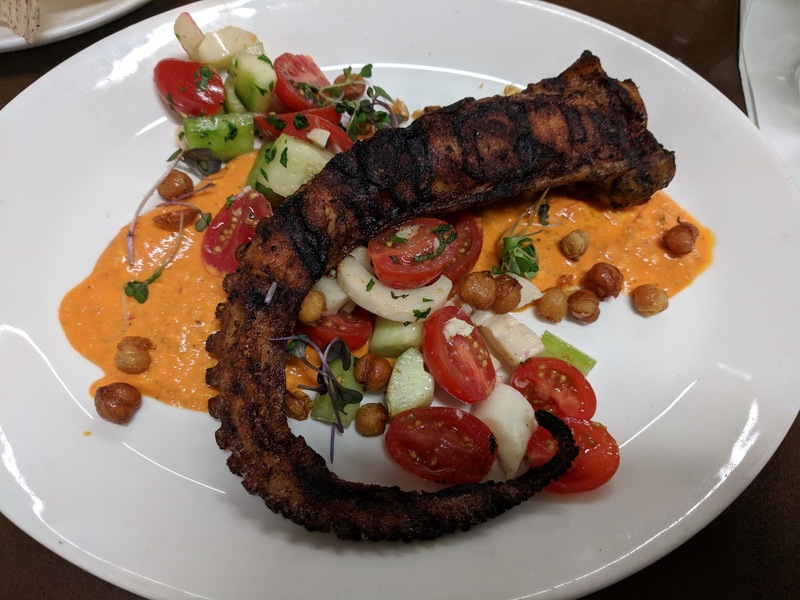 I think my server didn't charge me for them ... my bill had them on as a "Special Prep", but, the price for the octopus was the same as the menu price, so, uh, score?